The pH of the mash matters for any all grain brewer. Ideally you want to keep your mash pH in the 5.2-5.5 range, and for lighter beers driving the mash pH down to the 5.2 level becomes even more important to achieve good beer clarity. All grain beers benefits greatly from a low mash pH – promoting better conversion, a cleaner finish and a more balanced overall beer flavor. Unfortunately most mash mixtures will come in at a higher pH unless you adjust them. Water, whether from a surface or underground sources is typically alkaline. Grains, particularly dark grains, are slightly acidic, and will drive the mash pH lower once you mix the water and grains for the mash. Unless you are brewing a very dark beer style, however, you typically won’t have enough acid in the mash to drive the pH down to the desired 5.2 level. Often additives such as a buffer or acid is needed to adjust the mash pH. Traditionally, mashing is done at a relatively low water to grain ratio of around 1.25 quarts of water per pound of grain (a bit under 3 liters/kg). This results in a fairly thick mixture, and additional water is added after the mash is complete, during the sparge, to reach full volume. 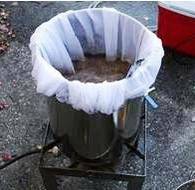 With Brew-in-a-bag, no-sparge, and some decoction mashes, a much higher water to grain ratio is used. Typically the full desired boil volume is used in the mash, giving a water to grain ratio that is 3-5x that used in a traditional mash. This means you have a relatively large quantity of alkaline water mixed with the same amount of “acidic” grains. So the resulting mixture will have a higher pH during the conversion step than it would have for a traditional mash that had only 1.25-1.5 quarts/lb. So if you want to achieve a proper mash pH, measuring and adjusting your mash pH is even more important for those mashing at high water/grain ratios. Unfortunately there is no way to know ahead of time what your mash pH will be during the critical conversion phase. Working with darker grains will result in a lower mash pH, but unfortunately there is enough variation in the acidity of various malts that it is virtually impossible for an average brewer to determine the mash pH in advance. Fortunately there are a lot of tools available to measure mash pH. A pH meter is probably the most accurate, but you can use test strips or a chemical test kit to measure as well. Be sure to get high accuracy test strips designed for brewing because generic water test strips do not have the accuracy needed. Once you have measured your mash pH, you need to adjust it – usually driving it lower by adding a buffer or some acid. Some choices include adding acid malt, a buffer such as Five Star’s 5.2 or acid such as lactic acid, all of which are widely available from most home brewing stores. You can either use a tool to calculate the amount to add or just add a little at a time until you get the mash pH you desire. I will note that if you are using a sparge or partial sparge, it is worthwhile to treat your sparge water as well. The sparge water does not need to reach 5.2, but I will typically add an amount of acid proportional to what I used for the main mash. Hopefully these tips on mash pH will help you – no matter which all grain method you are using. Thanks for joining me on the BeerSmith Home Brewing Blog. Be sure to sign up for my newsletter or my podcast (also on itunes…and youtube…and streaming radio station) for more great tips on homebrewing. Also check out the How to Brew Video series I shot with John Palmer if you want to learn more about all grain brewing.